A: Bloodrush is the LONGEST & MOST INTENSE haunted house in Omaha that takes place inside a huge forest! Journey through houses, shacks, camp sites, and more! Q: Do you take debit/credit card? A: NO. We are CASH ONLY. We do have an ATM on site if you need! A: We are located at 233rd & W Maple RD in the Elkhorn / Omaha area. A: Hell yeah! We strive to be the most intense haunt around by creating sets & scare tactics other haunts can’t match. 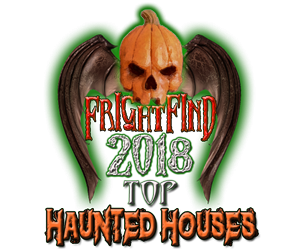 Don’t just take our word for it, Cosmopolitan rated us the Best Haunted House in Nebraska! Q: Does Bloodrush offer refunds? A: No. We do NOT offer refunds for any reason! If you lose your ticket (or ticket stub) you must purchase another. No exceptions. Q: If I’m too scared to go through can I get a refund? A: Again, NO REFUNDS. You’re here to get scared and we plan on making that happen! Q: How long does it take to get through Bloodrush? A: On average Bloodrush takes 40 minutes to get through, where most other haunted attractions take around 10 minutes to complete. Q: How many people can enter per group? A: Maximum group size is 6 people. We send groups through roughly every 60 seconds. Q: How long is the line to Bloodrush? A: Depends on a few factors. Friday’s & Saturday’s are the BUSIEST times for haunts. Expect to wait anywhere from 30mins to 2 hours during those days. We do as much as we can to keep the line moving as fast as possible while ensuring a quality show for everyone walking through. Weekdays are almost guaranteed to be no longer than a 30 minute wait! IF YOU HATE WAITING IN LINES, COME TO BLOODRUSH ON A WEEK NIGHT! Or simply purchase a “Fast Pass” or “Immediate Access Pass”! Q: Do you offer a Fast Pass? A: Yes! Fast Pass is available at the ticket booth for an extra cost. Keep in mind on busy nights there may be a short wait for Fast Pass ticket holders due to high demand. Q: Do you offer Immediate Access to Bloodrush? A: Yes! For an extra cost, you may purchase an “Immediate Access” ticket to eliminate the wait in line. Bypass the stand-by line. Bypass the Fast Pass line. If you have an Immediate Access ticket, then you’re next. Q: Can I buy tickets to Bloodrush online? A: Not at this time, but keep an eye out for online ticketing in the future! Q: Is there an age limit for Bloodrush? A: Bloodrush is all ages but keep in mind you will experience intense visual images, uneven paths, and loud noises. Children are not recommended to enter. We have had many kids enter Bloodrush that end up begging to get out. We have also had kids enter Bloodrush that ended up loving it! Parental discretion is strongly advised. Q: Can the monsters touch you inside the haunt? A: No. Do not touch the monsters or props and they won’t touch you! Q: Can I take pictures/video of Bloodrush? A: No photography of any kind is allowed inside the attraction. Feel free to take as many photos/videos of the exterior as you’d like! Q: Do you have any social media pages? Q: How long has Bloodrush been around? A: Bloodrush first opened in September of 2015!